A Sweet Valentine’s Day Giveaway! How do you say I Love You on Valentine’s Day? I prefer a little quite time with my hubby, if we can get it, and of course indulging in some sweets! I’ve got the perfect gift for your Valentine this weekend. 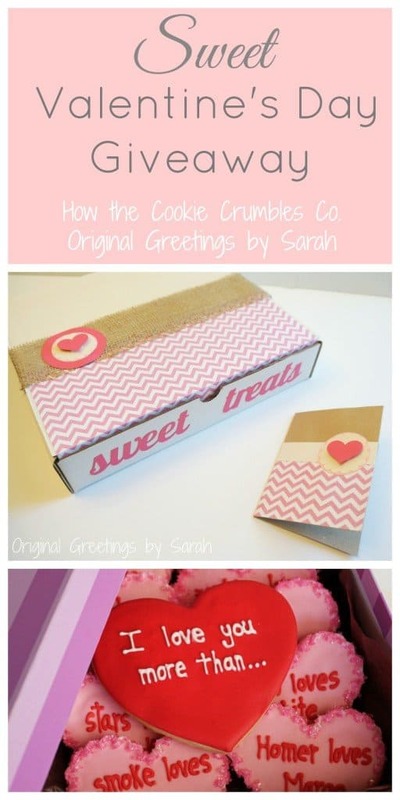 Show your sweetie how much you love them with Handmade Hand-decorated cookies from How the Cookie Crumbles Co. wrapped up in a gift box along with a card from Original Greetings by Sarah. Looks good right? Enter below to win, giveaway ends Sunday February 9, 2014 and is open to US residents only. Hopefully will be spending Valentine’s with husband and family and maybe new grandchild. Perfect way to spend Valentine’s Day is spending it with my husband and children and enjoying adorable goodies! Perfect way to spend valentines day is to relax at home with my husband and daughter! I love this.. nothing say I LOVE YOU MORE than a box of cookies .and a card.. . These yummy cookies would be great to share with a Valentine. Please enter me in the drawing.